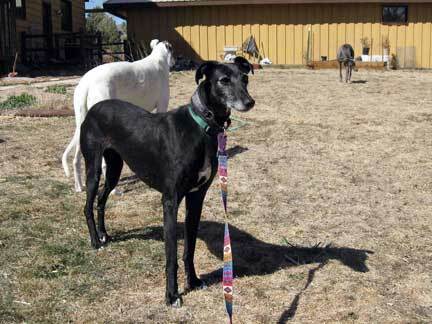 PRISA: From the Depths of a Well to a "Mile High"
On January 6, 2005 Prisa, along with four other galgos, was rescued from a 60 foot well in the Spanish countryside by the local firefighters and Scooby Medina refuge. Lucia, this gorgeous little Podenca, was found wandering alone with terrible wounds. The following video explains much more than I could... Many thanks to the people at Galgos Del Sol and Lucia's foster family, as well as Marylou, who'll be officially adopting Lucia in February when she comes to the United States! Kala is a beautiful 2 year old galga who just came from Scooby Medina Shelter in pain this week and is ready for her forever home. She has been fostered with reyhounds and does great with them. She is very sweet and affectionate and wags her ail when you talk to her. Kala is high prey so no kitties for her to live with. She has discovered the comforts of home and is ready for a soft bed to call her own. Would you like to help Kala find the happiness she so deserves? She has come this far and is just waiting for that very special family. Julia will steal your heart. A sweet galga from Scooby Medina of 5 years of age. She has a very mellow personality and gets along very well with other dogs. She is very sweet and adjusts quickly to new circumstances. She is loving life in the states with her foster family and is looking for her forever home to complete her dream. Are you the one she is looking for? Please email Telma Shaw at: odiesden @ cox.net for more information about Julia. GRIN’S October 2008 trip to Spain served two purposes. Our volunteers delivered much needed supplies to seven shelters: Arca Sevilla, San Anton, Recal Extremadura, Paws y Patas, Sofia El Refugio Escuela, Pro Galgo and Scooby Medina. They also took on the monumental task of returning to America with 7 lucky dogs bound for their forever homes! The trip was made possible by two wonderful volunteers from Ohio, Debbie Grega and Chris Mosey. Both ladies, first timers to Spain, took on a huge task, hauling over 200 lbs of supplies to Spain and then working tirelessly at Scooby Medina for a week, and finally, returning with 7 dogs. If you have not experienced a trip like this one, we can say that it is truly life changing for all involved. Those most affected by the life changing aspect of this last trip were of course, our Magnificent 7 who came together for a trip of a lifetime, a trip that would change their lives forever. Here are their stories. Torrente: A mild mannered beautiful Podenco from Northern Spain. Released by a hunter to Cristina Pascual of Amigos de Milord in Palencia Spain, Torrente had a tough beginning. He lived his life locked in a patio with a dozen other galgos and podencos at the mercy of the human who would come only every two weeks to feed the “tools of the trade”. This was Torrente’s life, to hunt and to suffer. In the winter many of his pack died of hypothermia in the bitter cold with no protection on that patio. He had survived and was tossed away like trash as he was not a “good hunter” anymore. We are so thankful to Cristina for rescuing him. When he came to our attention, his sweet demeanor was his calling card and it was not long before the perfect family came forward and asked for him and we began preparations for his adoption. Torrente scored!! Now living happily in Colorado with other canine companions and a loving family, he is living the life! He is Recovering from his fear of men and he is showing lots of affection to his forever family they love him dearly. 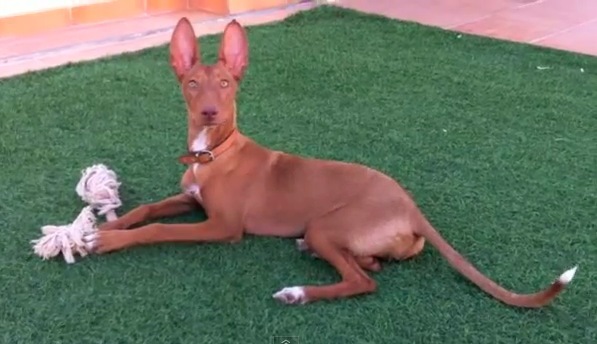 That is Torrente, a lucky Podenco from Palencia. Jacobo aka Argos: Scooby Galgo, prior life unknown other than he was fortunate to end up at Scooby. Having had a tough beginning in Spain, and even at the shelter, his transition in the states was a bit rocky at first, but thanks to his new mom and dad and their patience, Argos is now adjusted to living in a home and has charmed them with his loving and silly nature. He has become a beloved pack member to their existing canines and is said to be the life of the party! Way to go Argos! You are our Rock Star! Lilly and Lolli: Abandoned Galgo puppies, three months old, somehow made their way to Scooby Medina. Adorable, what can you say about Galgo puppies! Who can resist a galgo puppy, not volunteer Debbie Grega, who had picked Lolli out before the trip, in fact we were also able to bring her sister Lilly in the same crate as we had a wonderful adopter in Pennsylvania who had contacted Sandra Baas in Spain to find out how she could adopt a galgo puppy. Sandra referred her to GRIN and thus began the trip of a lifetime! Both girls doing great with Greyhound brothers and sisters and keeping new moms, Debbie and Colleen, on their toes! Andy aka Murphy: 5-month-old Andy was emaciated and had a tough beginning when he came to Scooby. No one knows much about him, he simply caught our attention on the website; the sad look on his face, the droopy ears, you know…the galgo look. He was so very fortunate to come to the U.S. He was ill when he arrived, but his new family nursed him back to health. He is now a happy and confident little guy who loves playing with his young German Shepherd packmate. He learned the ropes of living in comfort very quickly, his 5-year-old” Princess” Galga has taught him well. Here’s to a good life, Mr. Murphy! Silas: A middle-aged Spanish hunting dog, a Brittany spaniel. Long time resident of Scooby. He had been overlooked for more than a year until a Colorado angel named Lisa chose him for a better life. Now living with a pack of Greyhounds and other canines, Silas has come home..after much grooming his hair is soft and curly..a sweet gentleman, thanks to an angel..
Teo: Teo was our first arrival in the fall with another Scooby volunteer, Eva of Canada. Teo’s story starts in Sevilla. She lived in a hording situation with hundreds of malnourished and sick dogs, neglected, suffering..Scooby came to the rescue and brought many of these poor dogs to the shelter. Teo was one of many. A rough coated Galgo she made an impression on her new owner and she said yes to Teo and offered her a good life in upstate NY. She has room to run and play with Greyhound and canine friends. Life is good in her loving home. Teo is home.. These are our stories of our last group, thanks to all of our supporters we can make dreams come true. The Magnificent 7 (plus 1) thank you for helping us help them and those still in Spain. These dogs get the medical care they need with the supplies we send and again we thank all of you, our supporters. Happy Holidays! Telma Shaw Board Member G.R.I.N. Jazz entered our pack a couple days after his first birthday. Already having eight dogs in our pack, Jazz surprisingly made the transition smoothly. He is an easy going, loving, and kind soul. Being the youngest and biggest has made him very special. He shows great respect for our fourteen year old Dalmatian and is very patient and gentle with our whippet and six Italian Greyhounds. We never expected to add another kid to the family but it was love at first sight and I can't imagine a day without him. Ken & Gerri Slaughter, Jazz, Beamer, Simon, Sophia, Musso, Beppo, Joey, Latte, Bodhi and the birds and rabbits. * Jazz is a wonderful lurcher rescued by Telma Shaw of GRIN and other greyhound rescuers from a dreadful puppy mill situation in California. Little Orphan Andy Needs A Home! ADOPTED! UPDATE! Little Orphan Andy is an orphan no more! He is now known as Mr. Murphy and is happily living in his forever home with his parents, another galgo, and some other canine friends! Andy is a very special little galgo boy who badly needs a loving, forever home. He was rescued by Fermin Perez and the wonderful people at Scooby when he was just a wee pup, and then brought to the US on October 16, 2008 by a pair of GRIN's volunteers. Andy is a bit on the shy side at first but if you give him a few minutes (and a cookie never hurts, either), he will warm right up to you! He is only six months old and, though very well-cared for at Scooby, he IS a shelter puppy so he hasn't had the chance to become as well-socialized as if he'd been in a home his whole life. He simply needs love, guidance, and understanding and we are sure he will quickly become a loving part of the right family! Andy was adopted when he arrived but he wasn't the right fit for the family who chose him. We very badly want Andy to find a forever home, so if you are interested, please contact telma@galgorescue.org AND fill out an application (which you can find at http://www.galgorescue.org/content/view/35/48/) ASAP. Andy has had some GI upset since arriving in the US but has seen a veterinarian and is doing better now. He is not housebroken yet, and may need some time to figure out what is expected of him. Remember, he has never lived in a home and was always able to go potty wherever he was so he needs to "re-learn" what to do.